We offer a full line of upright and grand piano pedals. We have brass or nickel plated varieties. We have player piano pedals also. All hardware for pedal attachment and hinging available. Trap springs of all types on hand. What is a "trap?" This is the name of the mess of levers and rods in the bottom of your piano which operate the sustain and quieting of the piano as you play it. The pedals are part of this arrangement of course. Adjusting the pedals on your upright is very simple. That lets all of us in, right? 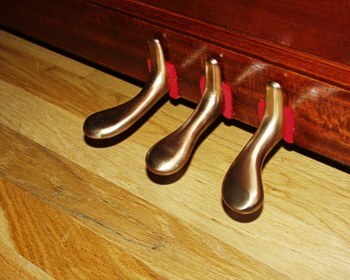 Take the lower board out of the piano by lifting the metal clip under the key bed. In some cases swing the wood lever out of the way. Set the lower board against the wall so that little Johnny can just squeeze behind it later to "play tent." He will wait until you are buried in the bottom of the piano, he will then slip behind the board, and he will gently push out on it. The board will hit the floor with a crash, and you will jump and smack your head against the key bed. These steps are very important to be sure that piano repair is a family affair. "Quality time" and all that rot, eh? There should be three levers (two levers for two pedal pianos) leaving from the pedal area and going outward to the sides of the lower box. Then round wooden rods go up to the action above to operate the sustain and quiet pedals. In some very recent pianos, the lever and rod work is metal. Also, some old uprights have the rods in two pieces, and they meet at the key bed in a felt covered hole. Recent pianos from the Orient may have a cable from one pedal operating a practice mute, while older uprights may have a two levers under the key bed which then operate the practice mute above. Whatever arrangement you have, the action of the pedal works is usually obvious. Most pianos have three square nuts, or wing nuts, on top of the ends of the metal rods right over the pedal area. These rods pull down (usually) on the wood levers inside the box. If you tighten these nuts down, you will take the slop out of the pedal action. BUT CAUTION-- You do not want to go beyond the point of removing the slop. If you overdo it, the sustain will ring on all of the time. Watch what is going on, and leave just a little looseness. Also, do not adjust the quiet pedal so that the hammer back rest has come off of its rest point on the iron posts holding the action. If a wood rod is missing, go around to Ace Hardware and buy several half inch wooden dowel rods the same size as yours. If the wood rod for your piano is missing, you will need to measure the distance from the top of the far end of the wood lever up to the point where the rod needs to push a metal lever. Up above in the action, there is a metal lever for the sustain which is always behind the action on the left. That will make you squirm to get the tape measure in place to get a reading. Always be sure you have the right hand (foot?) pedal operating the sustain. The quiet pedal also uses a wood rod like this. If yours is missing, this rod also goes up to the action, but it attaches to the wooden backrest for the hammers, which is hinged so that it can rock forward and diminish the force of the hammers hitting the strings. The wood dowel rod often attaches to the hammer backrest with a pin in the end of the rod which goes into a hole under the left end of the backrest wooden piece. You will have to insert pins in the ends of your new dowel rod. I suggest you drill a hole in each end so that you can push a nail into the hole snugly. We also sell these pins. Cut the head of the nail off with diagonal pliers so that the pin sticking out is about three quarters of an inch long. Remember how I said this is simple? Ha Ha Ha, and you believed me? A felt bushing should be added to the end of the rod at both ends to prevent clacking sounds from wood against metal. If you buy the pins from us, ask for a couple felt washers for this purpose. Some recent pianos, especially from the Orient, have metal rods with nylon or rubber inserts to add with the metal pin. These grommets muffle any clicking sound in the works. We can provide these if you wish to order them. You should not try to get by without some grommet arrangement if your piano needs them. Some old upright have two wood dowels which meet at the key bed. Be sure the hole where they meet has a felt lining to avoid noises. This arrangement is because it may be nearly impossible to fish a long rod down through a hole in the key bed without the rod jamming up. Also, be sure a felt piece is glued to the end of one rod where they meet to avoid noises. Some pianos, like Story and Clark and some Kimballs have a pedal rod rising from the middle of the piano straight up through a hole to the middle of the hammer back rest to quiet the piano. This is actually a superior design and is usually not a problem, but if there is no adjustment nut, you will have to add felt washers to the end of the stick to take out the slop. Some old uprights and some new Japanese pianos have a practice mute. This is a piece of felt on a long bar above the hammers. When activated, it drops the felt strip in front of the hammers so that they play very quietly. This was very popular in the early days of piano lessons when the student had to play scales and chords for hours. It kept him from driving his loved ones bananas. Now days, the early student is soon playing "Row, Row, Row your Boat" or "Santa Lucia" right away, and the practice mute is not needed. If you want yours to work again you may have to replace the felt. We can supply this felt in our Online Catalog. Adjustment is odd. The practice mute pedal will have a long metal rod going up to two levers under the key bed. These levers will run left and right to the sides of the box, and rods will go up to the damp mute. In this case the wooden rods will pull down rather than push up. There will be an adjustment principle in the thing somewhere so that you can control the placement of the mute, usually a turn buckle. It may also be that the mute comes to rest at some point, and you have to add or remove felt rest point material to adjust the mute. NEVER push tacks in the front of the hammers to make a honky tonk. Some pianos have a "stop" type mute control. This will be a lever at the left or right end of the keys. Adjustment will be similar. A very few uprights have a "sostonuto" sustain. After depressing a chord, the "sostonuto" pedal is pressed and that chord is sustained alone until the pedal is let up. This is very common on better grands, be rare on uprights. If you have this, and if some of the keys do not sosto when you nuto, I suggest you call your tuner to make the adjustment. If you are mechanically clever, a long stare at the action as the sostonuto pedal is worked will possibly tell you what is wrong. If it makes sense to you, go at it. Watch the ones working correctly to tell what your objective is. There is an adjustment screw which positions the flip flop lever that makes the notes sustain. Also, see if the bar that hinges into position is set right to interrupt the small levers when activated. See if its hinges are sound and tight. There are some rare old uprights which have five pedals. They have a regular junk yard of bells and whistles hidden away which respond to the pedals. If you have one, you ought to call your tuner if you need them adjusted. On older pianos you may find that the pedal mounting hinge or fulcrum is loose. Clean the area well so that you can find the screws. Tighten them. However; they are often stripped. It is not proper to screw them to the floor under the piano with six inch screws :-) Remove the whole assembly, and fill the holes with Elmer's glue and toothpicks. Reassemble. There may also be metal levers attached under the long wood levers in the bottom, and they may be loose. Remove them, and treat the mounting holes the same as above. These levers and springs break sometimes, and you can order them from our Online Catalog. If you have made the pedal works operate right, and the sustain still does not work well, you probably have a defect up above in the action. The rod in the action that turns and moves the dampers is broken or messed up in its mounting. You will have to remove the action and set it on a table. If the hinge arrangement has stripped screws, you can remove it and reset the screws as above. If an "L" rod is broken which mounts the rod to the action, you will need to have it repaired. Remove the damper activating rod from the action (Ugh), and take it to a welder to have the "L" rod welded or braised back on. You may want to have your mechanical friend drill out the old "L" rod piece from the metal operating rod. Put in a new "L" rod and braise it in place. Be very sure to duplicate the length of the "L" rod to match the others. Be careful since the "L" rods may not all face the same way. Some pianos have two sustains, one for the bass, and one for the whole scale. If the bass dampers lift off the strings OK, but the treble do not, you may need to get into the action and put a piece of something, like leather, at the point where the left (bass) rod connects to the rod which sustains the treble. Credit where credit is due-- Mark McCarthy, a customer, used this method to replace pedals on a Wurlitzer spinet. He laid the piano down on its back, and he removed the bottom board. Read our Caster Repair Page for instructions on laying a piano down. The pedals come away from the piano with the board. Of course, disconnect the pedals from the wood levers first. Remove and replace the pedals, and put the board back on the piano. Add a bit of wood and Elmer's carpenter's glue to the screw holes so they are real tight again. This is the only time you can service the bottom board, so get the screws tight. That's it! Genius from Illinois. This could be done of course with a full sized upright, but you must follow the instructions in our Caster Repair Page for laying it down. You will need to bribe a couple of friends to help lay a full sized upright down safely. That usually is done with pizza, but in parts of New York City and Boston, use canolis (for Italians) or baklava (for Arabs). Kurt Kretschmer did a short cut restoration for economy reasons. He buffed his pedals on a fine wire wheel, and the results are quite good. He said he started with brass pedals. A coat of satin lacquer should be added, and the results are very pleasing with the new pedal felt added. I would have sent them off to be plated with chrome myself. Also, the wear on the right pedal means the pedal could wear through soon. New pedals might be a better alternative, but I have a hard time to argue with Kurt's results-- nice to look at.